Toast sourdough bread lightly in toaster. To spatchcock the chicken, using poultry shears or other sharp scissors, cut down the spine of the bird and remove it. Press down on the breast of the chicken to open it out flat. Put chicken into a roasting pan and sprinkle all over with 1 tablespoon of olive oil, paprika, and thyme. Toast for 35-40 minutes until chicken is golden and cooked through. While chicken is cooking, put grapes into a small saucepan with the white wine and bring to a boil. Remove from heat and set aside. Toast the pinenuts in a small, hot, dry frying pan until golden. Set aside. Cut the sourdough bread into croutons. Heat remaining olive oil in the frying pan and fry croutons until crisp. Set aside. 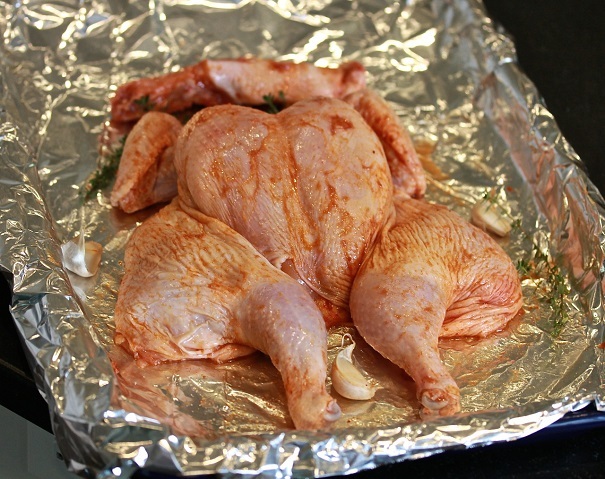 When the chicken is cooked, let is stand outside the oven for five minutes. Discard thyme. Arrange spinach leaves on a platter. Whisk together the mustard, salt, vinegar, and 3 tablespoons of the extra virgin olive oil. Place the chicken and garlic cloves on top of the spinach. Pour remaining pan juices into the olive oil mixture, and whisk. 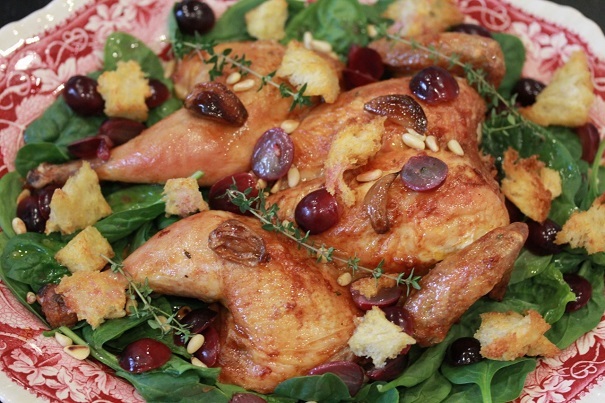 Pour dressing over chicken and spinach, sprinkle with pinenuts, croutons and several more fresh sprigs of thyme. Chicken can be made a day in advance and refrigerated.